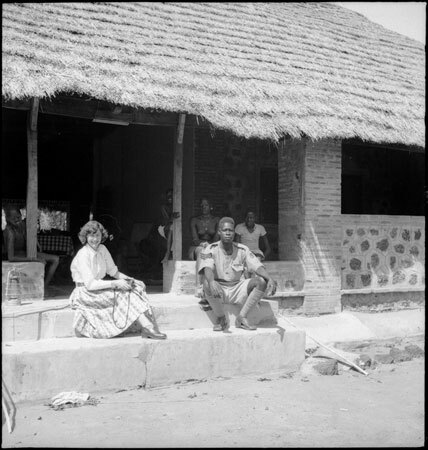 A portrait of Oxford anthropologist Jean Buxton holding her camera sitting on the steps of a brick and thatch building, probably in Tali. Next to her is the Mandari sergeant, Makelele Nyayo, who was charged with looking after her personal safety, and sitting in the shade of the vernadah behind are several young Mandari women. Morton, Chris. "Jean Buxton with Mandari minder" Southern Sudan Project (in development). 03 Jan. 2006. Pitt Rivers Museum. <http://southernsudan.prm.ox.ac.uk/details/1998.97.570/>.